Student Association organizes 5th annual St. Baldrick’s Day fundraiser. Chanting, cheering, and the buzzing sound of heads being shaved could be heard on campus Thursday, April 26 as 47 Saint Rose students, faculty, and community members “braved the shave”—to raise awareness and help the fight against childhood cancer. St. Baldrick’s Day has become an annual event on the Saint Rose campus, filling the Main Lounge every year. The day is completely organized and run by members of the Student Association (SA) Community Service Committee, from signing up shavees to promoting the event to lining up sponsors. Sammy Styles Barber Shop, located at 785 Madison Ave., staff it with barbers who donate their services to those who have chosen to go completely bald in solidarity with children affected by cancer. Not every participant had signed up, raised funds, or planned for months. 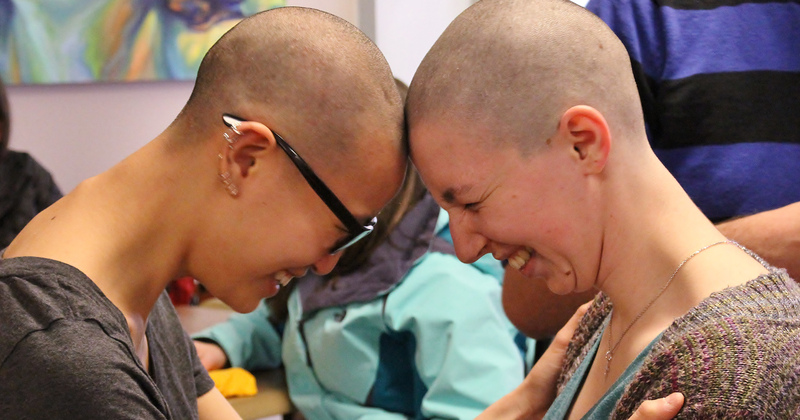 Among the 47 shavees, 17 walk-ins braved the shave on the spot, including Kari Hendrickson ’18, who was inspired to share a message with others. “I feel in life that a lot of people, especially cancer patients, feel that something was taken away from them. I want to be that person that’s like ‘You are beautiful just the way you are,’” Hendrickson said. So far, online fundraising is approaching $14,000, while another $2,570.84 was raised at the March 26 event, putting SA closer to this year’s goal of $20,000. To make a donation, visit The College of Saint Rose St. Baldrick’s page located here.